Mr.AahH! !-Over 2,000,000 downloads all over the world! "Mr.AahH!! 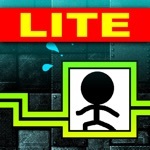 Lite" is a great game which gives you great thrills and exhilaration. With a very simple control, enjoy this action game which gives you outstanding exhilaration. Tap in a timely manner and land on the next cliff!! Be careful not to shout out too loud when you fail to land." Now, let's let out your "AAaahhHH!!!" There are some factors which influence your jump, Wind and gravity. 2,000,000 downloads all over the world. Simple and addictive game play is very popular around the world! This game shows us exactly the kind of game required for iPhone. It's strangely addictive and compelling to play again and again. This game is awesome! Great mechanics and very simplistic and polished art style akin to Japanese design quality. In my opinion, "Mr.AahH!!" 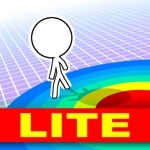 ranks right up there with the simple classics of the App Store like Doodle Jump, Flight Control, etc. 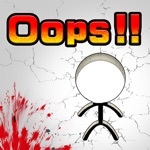 It’ll keep you busy for a while, and it’s one of those games what will get you addicted. The graphics are cartoony and fun, yet simple enough to not draw your focus away from the objective. 1.Tap the screen to jump! 2.Get a high score, "JUST", by landing on the center of cliffs! 3.Make a much higher score by scoring "JUST" consecutively! 4.Be number one in the global high score ranking! -You have only one life. -Anybody, Everybody can simply enjoy heated actions. -Today's Rankings are playable everyday. 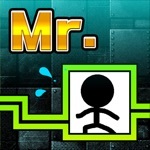 -Using acceleration sensor refines movement of "Mr.AahH!!" in the air by slightly tilting iPhone. -You can listen to iPod while playing.